This is aa photo of my dad's brother's wedding in 1958. 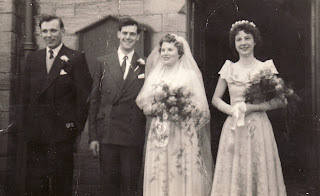 Laurence Scown married Margaret Nattress in Wolsingham PM Chapel in February 1957. The best man was Donald Craggs, the bridesdmaid is Joan. (Her married name is Joan Allen, but I will find out her maiden name). They now live in Wolsingham and have a son Nigel and a daughter Diane.